A maser is just like a laser, only it shoots electromagnetic radiation in the microwave range. If this doesn’t sound familiar, you’re not alone. Despite being the precursor to the laser, the maser is rather obscure because of the difficulty of manufacturing and operating one. Usually, they’re confined to ‘esoteric’ niches like astrophysics. That’s mostly because a maser needs to be cooled down to almost absolute zero to function, making it extremely bulky and expensive. But now, scientists at Imperial College London (ICL) have unveiled the world’s first continuous room-temperature solid-state maser, opening up a myriad of new opportunities in research. Maser stands for “microwave amplification by stimulated emission of radiation.” It fires higher frequency photons in the ultraviolet or visible light spectrum — a beam of microwaves, essentially, instead of a beam of light, as a laser does. Masers were invented in the 1950s and laid the groundwork for the invention of the laser in the early 1960s, but soon enough the two technologies drifted apart significantly. Today, it’s not uncommon at all to find half a dozen lasers in the typical American household embedded in various technological items, from DVD players to optical cables. Masers, on the other hand, have remained confined mainly to astrophysical labs, far away from the public’s perception. What the ICL researchers led by Dr. Jonathan Breeze managed to do was to devise a new maser that is solid state, operates at room temperature and doesn’t require a magnetic field. In 2012, the same team built such a maser that used the organic molecule pentacene, instead of a hard, inorganic maser crystal. However, this maser was not able to work continuously, as the radiation would have eventually melted the crystal molecules. Now, the scientists found a solution by using a different material: a synthetic diamond grown in a nitrogen-rich atmosphere. A high-energy electron beam was used to knock carbon atoms out of the synthetic diamond, which left very tiny holes or vacancies in the diamond’s atomic structure. When the scientists heated the diamond, the nitrogen atoms and the carbon vacancies paired off, forming so-called nitrogen-vacancy defect centers. The final step was placing the diamond inside a sapphire ring. 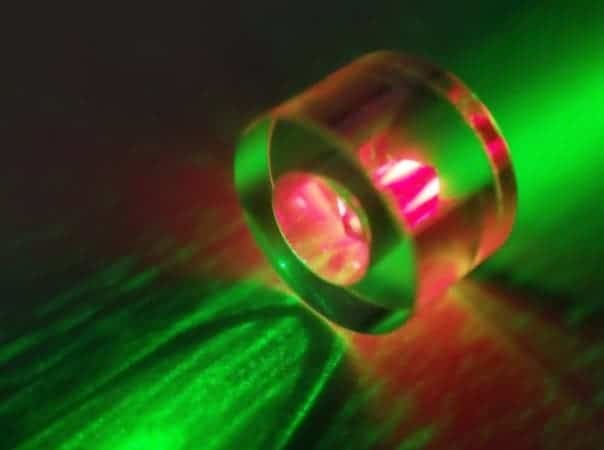 When a green laser light was shone on it, a continuous stream of laser light was emitted — and all at room temperature. Masers are employed in radio astronomy observatories and deep space communication. This latest breakthrough could significantly expand the range of their application, allowing the use of masers in a diverse range of fields from medical imaging to quantum computing. “This technology has a way to go, but I can see it being used where sensitive detection of microwaves is essential,” said Neil Alford, a professor of material science at ICL.